Bandai Namco Entertainment has announced My Hero One’s Justice will be released for Nintendo Switch at retail and eShop on October 26, 2018 in the west. My Hero One’s Justice will soon be available for pre-order via Nintendo eShop. 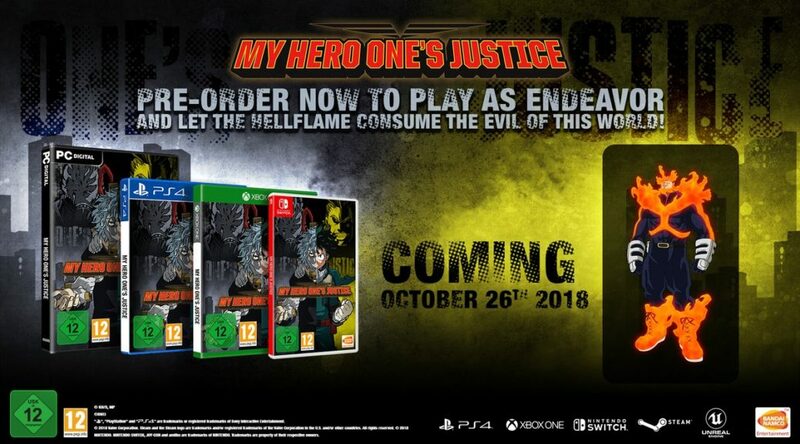 All pre-orders will come with Pro-Hero Endeavor for free. Check out the latest trailer and information below. Attention all MY HERO fans! MY HERO ONE’S JUSTICE, the 3D arena fighting game based on the popular Weekly Shonen Jump® manga and anime franchise, will officially arrive in the Americas on October 26, 2018; the game will be available for the PlayStation®4 computer entertainment system, Xbox One, PC via STEAM®, and Nintendo Switch™. In celebration of this announcement, BANDAI NAMCO Entertainment America Inc. is revealing three new playable characters, one of which will be available as an early-access pre-order bonus. Two characters pivotal to the anime’s third season will be joining the game’s roster at launch: Gran Torino, the retired Pro Hero and revered teacher of both All Might and Izuku Midoriya, and Muscular, the sadistic enforcer of the League of Villains’ Vanguard Action Squad. Gran Torino’s Quirk, “Jet,” helps him bounce around battlefields at nearly untraceable speeds, while Muscular’s “Muscle Augmentation” enhances his physical abilities (and physique) to superhuman levels. Players who pre-order MY HERO ONE’S JUSTICE will also receive “Flame Hero” Endeavor—the #2 Pro Hero, heated rival of All Might and father of Shoto Todoroki—as a playable character. Endeavor ignites the fight with his “Hellflame” Quirk, incinerating opponents with an overwhelming barrage of fire-based techniques. MY HERO ONE’S JUSTICE gives players the opportunity to experience iconic moments from the MY HERO series like never before, featuring a Story Mode played from the perspective of both the Heroes and the Villains. In addition to the unique story, the game also offers a robust character customization system, enabling players to put their own quirky twists on each Hero and Villain uniform with costume pieces from across the MY HERO universe, such as Eraserhead’s glasses, Katsuki Bakugo’s gauntlets, and even a leg-hugging Minoru Mineta plush.